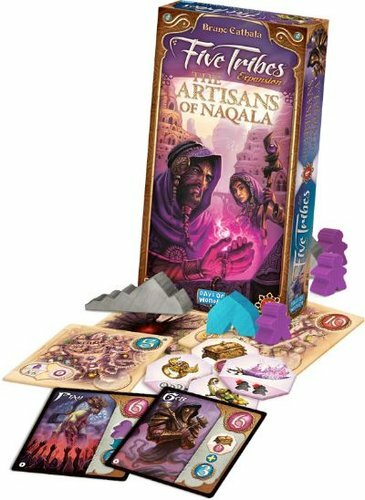 Represented by purple Meeples, the Artisans make up a new Tribe and add a new layer of strategy in the game. With their help, players will be able to have precious or magic items crafted. Some of them are worth Victory Points, while others unlock special powers. 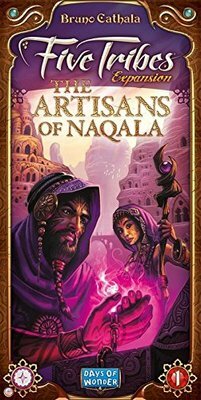 To accommodate these new Meeples, the expansion also features new Djinns and new Tiles: Workshops (where the Artisans craft their Items) and Specialized Markets (where players can buy specific Merchandise when needed). An impassable Chasm Tile, as well as Mountain markers, also force the players to adapt their strategy when moving Meeples on the board. Expansion requires Five Tribes Base Game to use; Introduces a new tribe to the game, and players will want to use these artisans to help them in their quest to claim the Sultanate.